Nothing says I love you like a warm from the oven chocolate chip cookie. Except, of course, when it comes in the shape of a heart. 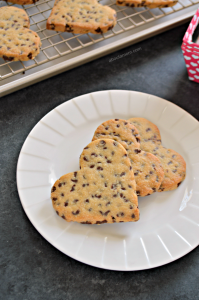 These heart shaped chocolate chip cookies are the perfect way to say “I love you” this Valentine’s Day or any day of the year. 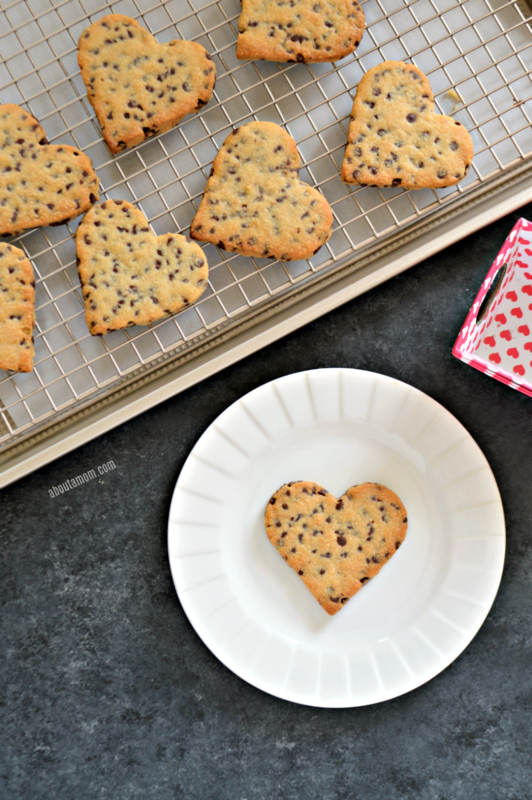 I’m sharing these chocolate chip cookie cutouts today in support of the Good Cookie Food Bloggers Valentine’s Event to help raise awareness and funds for the fight against pediatric cancer. More information, along with a donation link is available at the bottom of this post. Be sure to visit some of the other bloggers participating and see their fabulous Valentine’s Day recipes! Chocolate chip cookies are hands down the cookie of choice in my house. Nothing fancy, just a good old fashioned chocolate chip cookie. You know, one of those recipes you know by heart. 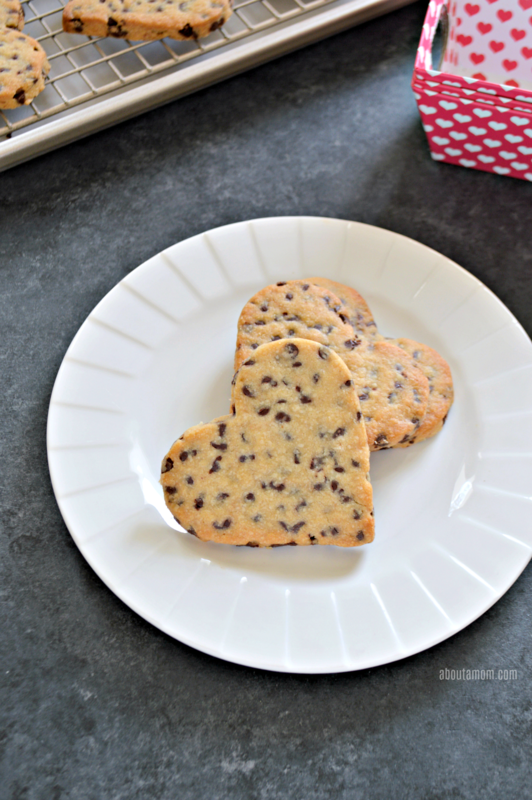 I used the same basic chocolate chip recipe that I’ve used forever to make these Valentine’s Day cookies, only this time I rolled out the dough and used a heart-shaped cookie cutter. You don’t even really need to roll out the dough out into one big sheet to make these. You can just smoosh individual balls of dough flat with the palm of your hand and cut them out one at a time. This is a fun way to do it if you are baking with children. These are great to package up and give as gifts! Cream together the butter and sugars. Add the egg yolk and vanilla. Sift together the flour and salt, and add to the butter and sugar mixture one cup at a time, until completely incorporated. Dough should have a crumbly consistency that you can easily shape into a ball. Gently fold in the chocolate chips. You can use your mixer, but I recommend doing this with your hands, so you don’t break up the chips. Shape dough into a slightly flattened disc, wrap in plastic wrap, and chill for at least thirty minutes. Roll dough onto lightly floured parchment paper, cut into shapes with a 2-inch heart shaped cutter. Place cookies onto a parchment lined baking sheet and pace in the refrigerator for about 10 minutes. This will help prevent spreading. Meanwhile, preheat oven to 350°. Place chilled cookies into preheated oven and bake at 350° for 10-12 minutes or until golden brown. Remove from oven and allow to cool 2 – 3 minutes. Carefully, transfer to a wire rack and allow to cool completely. Gently fold in the chocolate chips. You can use your mixer, but I recommend doing this with your hands, so you don't break up the chips. Shape dough into a slightly flattened disc, wrap in plastic wrap, and chill for at least thirty minutes. Roll dough onto lightly floured parchment paper, cut into shapes with a 2-inch heart shaped cutter. Place cookies onto a parchment lined baking sheet and pace in the refrigerator for about 10 minutes. This will help prevent spreading. Meanwhile, preheat oven to 350°. Place chilled cookies into preheated oven and bake at 350° for 10-12 minutes or until golden brown. Remove from oven and allow to cool 2 - 3 minutes. Carefully, transfer to a wire rack and allow to cool completely. 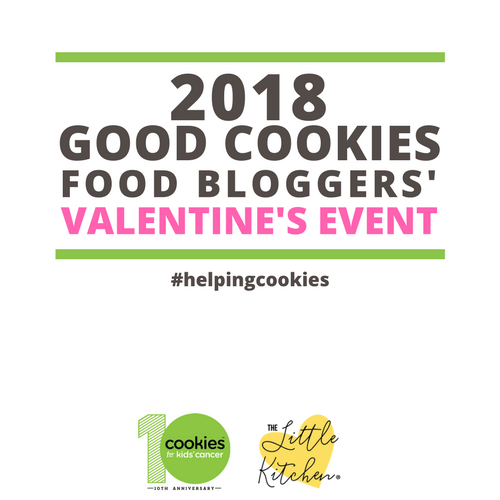 This is the second year for the Good Cookie Food Bloggers Valentine’s Event! We want to make a difference in the fight against pediatric cancer! If you like this recipe, please PIN IT and share with your friends! Be sure to check out all of these fantastic recipes by the other bloggers! This is such a cute idea. i think we will be making these. These are adorable. Thank for the great idea and list of recipes! These look yummy and are super cute. Great idea or Valentines Day. These look so pretty! I love the heart shape! I will definitely have to try this! I have never heard of Cookies For Kids’ Cancer. Thank you for raising awareness and money for such an important cause! Very cute and delicious idea! I’d love to make these as a special treat for my grandsons and could even give some to their teachers! I love these. You are right, chocolate is a favorite in our house also. These heart shaped ones are too cute. These are so cute! And I love how loaded with chocolate chips these are. My kind of chocolate chip cookies! Chocolate chip cookies are a staple at my house, I love the cute heart shape. These cookies look very cute . I have a heart shaped cutter and should use it more. Lots of really great recipes here, thanks! 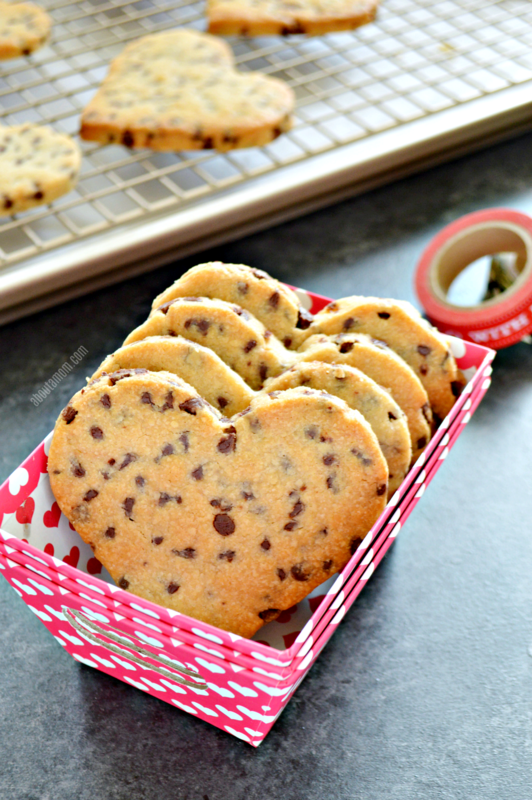 I love your Heart Shaped Chocolate Chip cookies, so cute! I will be making these next year. 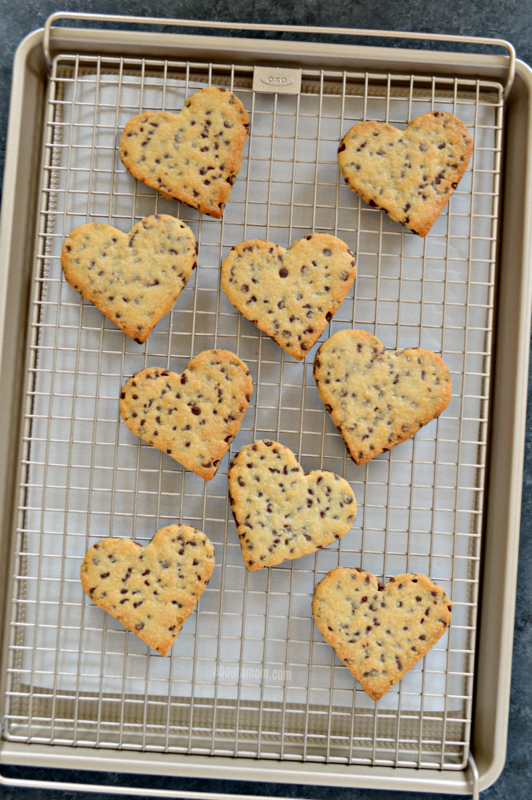 Because the Heart Shaped Chocolate Chip Cookies looks as delicious as it does, I can’t wait to try this special recipe out. I only hope I will be able do as good as you did in the heartwarming photos. I want to make these. They sound delicious. So fun and adorable! I have a few birthday celebrations coming up these would be so cute to make for it. I love everything hearts, and wow! I make chocolate chip cookies all the time, and never thought to make them heart-shaped. I must try this! These are super cute! Will have to try these for my husband’s birthday! That is a great cookie recipe. I have been using it for a long time.